I know dating sites still carry some stigma but, really guys, it’s way past time for us to get over it. Meeting someone through the internet is worlds different from answering a personal ad in the newspaper. (You know, like that dude who really loves pina coladas.) According to Reuters, 40 million of the 54 million single people in the United States have tried online dating, so it only makes sense that startup entrepreneurs are rushing to serve the market. 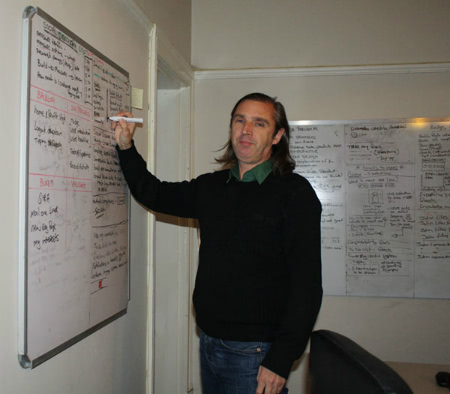 One of the latest comes from co-founder Robin Jones, who started the website Daterly. Robin and company believe that using mathematical formulas to make love connections is ridiculous and that hook-up sites are fun but aren’t really great for forming lasting relationships. Their answers to those problems is a low-key dating site that’s set up kind like Facebook, in that you have conversations about things that you’re into without the pressure that can be present on other websites. Robin took some time to chat with KillerStartups about his experiences with the internet, the startup universe, and why you should really open a profile on Daterly. Choosing the name I wrote down lots of options, starting with the shortest and easiest to remember. I also wanted to include the word date. It was then a process of elimination and what was available as a TLD. How long have you been involved with the internet? What were your first steps? What was your first computer? How old were you when you first got on the world wide web? My first computer was an Amiga 500, but quickly upgraded to a Mackintosh classic. I first got onto the internet in the early 90’s; it was very basic back then, dial up, bulletin boards, the first websites were very crude. I still remember connecting for the first time, I didn’t know I was online, it was like, oh is this it? I first started developing websites about 7 years ago and full time for two years now. 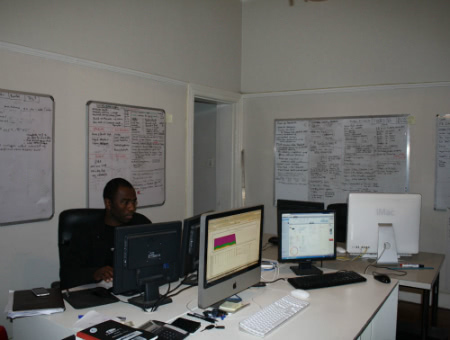 I started the company myself and employed a developer soon after. Now there are three of us. What makes your startup different? 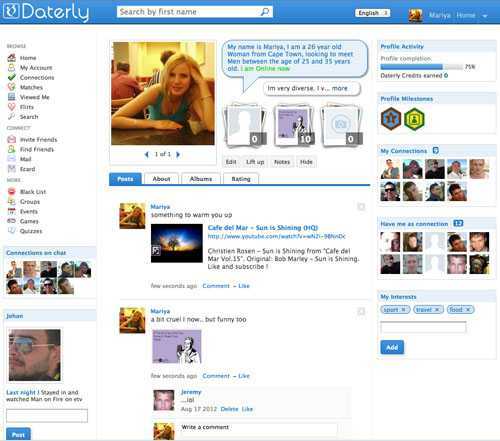 Daterly is a social dating network for singles. Matching a potential partner with a mathematical equation will never produce meaningful results. Sharing what you do on a daily basis, what book you are reading, what movie you saw last night, sharing what you just read in the news, what restaurant you ate at last night or where you met your friends for drinks. All these activities describe your lifestyle and the type of person you are. It’s authentic. You will have plenty in common and lots to talk about on your first date. It is still early days. Building a product that no one wants to use and then doing it a second and third time is a learning process that you don’t really need to go through. It was at this stage, frustrated after having read Viral Loop for the tenth time I found myself in the business section of my local book store, I across The Lean Startup by Eric Ries. This resulted in a step change. Taking a new approach to product development, I threw everything out and started again with a basic hypothesis, building minimum viable products and measuring using cohort analysis I was able to isolate what was working using real data collected from real users. Knowing what to build through validated learning then iterating through the process of build – measure – learn. The office is vey relaxed, mostly quiet but punctuated with laughter after sharing a meme. 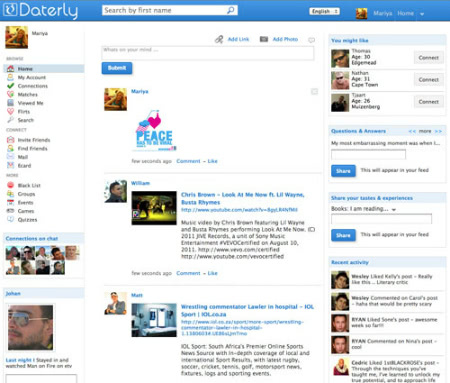 I would like to see Daterly grow into the default social network for singles in the way that LinkedIn has for business. I see the service improving in the area of social discovery and recommendation features with users being able to Check-in to a bookshop or bar and share experiences in realtime, a kind of snapshop of your life, just like sharing a photo. I have a vision of a platform that does not use your data to serve up advertising, but rather to provide you with rich contextual information that is relevant to what is happening in your life right now. Your social resume remains current, peppered with anecdotal evidence of your values, aspirations and varied interests. If you were given inside access to 2 internet companies to invest in, which ones would you pick? Daterly generates a small amount of revenue, the balance is self funded on a bootstrap budget. Is there anything you used to believe was impossible that you have already accomplished unexpectedly? I believe that anything is possible, if you don’t at first succeed at something, try harder, don’t ever give up. If your accomplishments come easy, you probably haven’t aimed high enough. What’s your best tip/hack/trick for balancing work and life? Take an hour off each week and go for a walk to clear your mind. I have a favorite place where I walk and breathe in the sea air. The rest of the time stay focused on your goal. What’s your favorite music streaming site and what’s playing on it right now? I’m listening to Alt-J and Nicolas Jaar. I use Youtube, running in another tab. Apart from the pesky ads, the playlist and search features are great. Soundcloud is great too, we will be adding this to Daterly in the near future. Which of the following companies you wish you had created, and why? Facebook, Google, Twitter, Quora, YCombinator, Youtube, Zynga, Groupon, Linkedin, Apple. Each of these companies have been created under unique circumstances through great partnerships, but it is Apple that really stands out for me. Apple has risen to the top through hard work, persistence and self-belief. All the other companies have not yet passed the test of time. Proof that building a superior product beats “First and good beats last and great” the war cry of some of the companies above, as well as being a widely believed notion. I have always been inspired by great entrepreneurs with expansive vision who ignore the status quo and blaze their own trail. Think big, start small. The ability to bring people together, providing a platform for people to meet. When you host a party and people meet friends of friends for the first time, it’s a good feeling. Facebook, Twitter, and our blog.